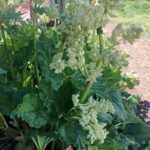 I planted a rhubarb plant this spring and now that winter is coming on I want to know how to winterize it. I did not harvest any stalks this summer, and now it has a few stalks and leaves left. Should I cut the stalks down before covering with mulch, or should I just leave them? I live in Fairbanks, AK, so we experience a pretty hard winter. Any help you can provide will be appreciated.